Clark, Stewart, Lauda, Prost, Senna, Mansell and Schumacher all went on to win more than his 24 Grands Prix, but only Schumacher has ever been able to beat Juan-Manuel Fangio's record of five World Championships. And the Argentinean, who died the day after the British GP in 1995, is still championed by many the world over as the best racing driver there has been. In his lifetime he was revered across the globe as the epitome of the sporting champion, a short, bandy-legged character with a high-pitched voice and penetrating clear blue eyes. An icon who spoke no English, yet whose startling charisma was its own language. The son of Italian immigrants who settled in Balcarce, a small town south of Buenos Aires, Fangio was a veteran of stamina-building cross-country marathons in his homeland. First he raced a Model T Ford, later a more potent V8. Then his neighbors helped him to buy a Chevrolet, and over the next seven years he fought against arch rival Oscar Galvez for top honors. In 1948 a contingent of European racers of the highest caliber went to race in Argentina. Among them was the emergent Jean-Pierre Wimille, believed by many to be one of the most underrated and underwritten drivers of all time. Fangio impressed Wimille so much that he put the word around. The government sponsored Fangio and Galvez on a sortie to Europe, and repeated the gesture the following year. Armed with a Maserati 4CLT, Fangio astonished the Europeans by winning in San Remo, and then again at Perpignan, Marseilles, Pau, Albi and Monza. From 1950, when the World Championship was officially inaugurated and he had been invited to join Alfa Romeo, until his abrupt retirement in the middle of 1958, he was the man to beat. Cool, unruffled and possessed of tigerish strength and endurance, he drove only just as fast as he needed to win, though as he revealed on days such as that at the legendary Nurburgring in 1957, he could take on and beat the world's best even though he was then well into his forties. In that race he shrewdly started with a low fuel load and built a healthy lead in his Maserati, only to lose double that advantage in a disastrous pit stop. Undaunted, he returned to the battle to challenge and conquer the young English lions Mike Hawthorn and Peter Collins in their Ferraris, to win the greatest of all his triumphs. 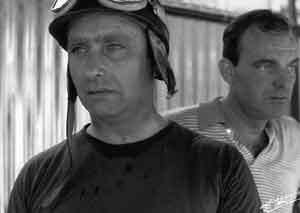 Even Fangio admitted afterwards that he had never driven so hard, for so long. A quiet, self-effacing character out of the cockpit, Fangio was a tough competitor within it, and had the killer instinct of the natural winner. He was runner-up in 1950, won his first title in 1951, and then repeated the successes from 1954 through until 1957. Unlike almost all of his rivals, then and since, he had no compunction about leaving a team, even after a successful year, if he thought he would have a better chance with another in the ensuing season. In 1952 he joined Maserati when Alfa Romeo withdrew. Part way through 1954 he switched to Mercedes-Benz. When the Germans withdrew at the end of 1955, he spent an unhappy year with Ferrari before going back to Maserati for the remainder of his career. Fangio could coax and cajole his machinery into giving a better performance, or into surviving long enough to finish. While he raced he was, as Moss, Clark, Senna and Schumacher would be, the yardstick by which others were judged, and by which they judged themselves.